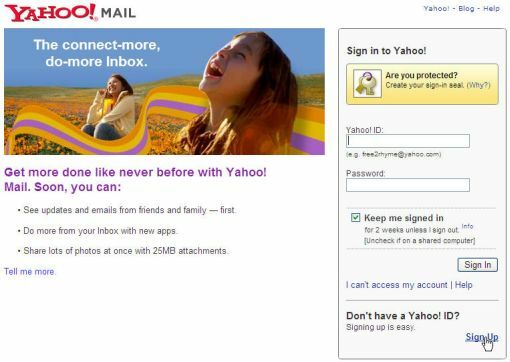 "Free Yahoo Email Account Sign Up"
Do you have the free Yahoo email account? If not, you can get one for free. 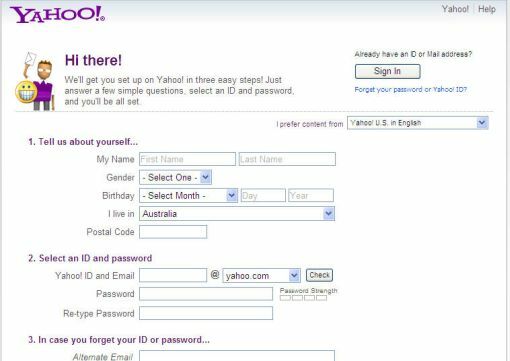 This tutorial will guide you step-by-step on how to sign-up a free Yahoo account. Once you get the account, you can start using it to send the email messages to your friends. Launch the Internet Explorer or any other Internet browser. In the Address bar: type www.mail.yahoo.com and press Enter. In the Don't have a Yahoo! ID? Section, click Sign Up to create a Yahoo! ID. From the sign up form, fill up all the entries (Name, Gender, etc) including the catcha code. Click Create My Account button. Follow the instruction on the screen to complete the sign-up. Note: Do remember or write the Yahoo ID and password in the safe place as you will need it every time you want to login to the Yahoo mail. So, the sign-up process is one time and you can use the account forever. In the next time you just need to login to the account to use the services. In the Yahoo! ID: section, insert your yahoo ID. In the Password: section, insert your yahoo password. Note: If you check the Keep me signed in option, you will automatically logon to your Yahoo account if you never sign out your account. You can choose the option if you're not using public computer.